Posts: 3 Hello all. 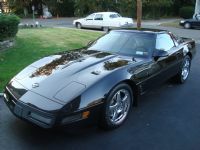 I’m new to the Corvette world as I just bought my first one. It’s an ‘89 convertible hardtop. I’ll have many questions I’m sure but my first one is, Do they all rattle? Thanks! Posts: 76 Welcome to the Forum. I have a 95 without a single rattle. I guess you need to be more specific on the "rattle" situation. I am sure one of the members will assist you. Again welcome and enjoy your C4. Posts: 3 Thanks. It rattles a little when going over a less than smooth road. I’m thinking it could be the hardtop. Posts: 71 No rattles in my '84. Any car can rattle if there's something loose somewhere. Don't let anyone tell you "they all do that"! There's no reason a Corvette should rattle more than any other car. Chase each problem as it comes up. Don't let them accumulate, or you'll get frustrated. Our 'vette's are getting up in years, so they might take a little extra attention. Enjoy your new ride! Posts: 48 My advise is to find each rattle address it accordingly. Somethings could be loose (don't over tighten) & somethings could be addressed by felt decals or Velcro strips that were used in later models. See the after market Corvette catalogs about same. Posts: 3 Thanks for the replies guys. One other question: I just had a spare “chip” (vats?) key made at my local Ace hardware. Does it have to be programmed? When I put it in the ignition the dash lights up but when I tried to start it nothing happens. The original key won’t even work after I do this. Any suggestions? The first scenario is a duplication of the ignition key with another operating key available. The second is a duplication without any ignition key available. I will assume you have a working ignition key available. There are 2 codes the ignition key has to make it usable to start the car. There's the mechanical code and the electrical code. The mechanical code is the physical "cutting" of the key like any other key. Based on what you said, the mechanical code is correct otherwise the ignition lock would not unlock. What the problem appears to be is the electrical code is incorrect or maybe missing. Did the local ACE Hardware store determine which electrical code your operating key had with a reading device? Do you know what the code is? If so, obviously don't state it here but go back to ACE, explain the problem and have them check to see if the replacement key has the same electrical code as the original. If not, they cut the wrong key. If they did not read it or don't know what your referring to then either the replacement key has the wrong electrical code or maybe it's missing. If you can't resolve the problem with ACE then you will have to go to the dealer. Also, try the original key again without trying the replacement. It should work. The manual mentions in the "second" scenario duplication process that the Ignition Switch must be off for at least 4 minutes before making another attempt at starting the car.